Where did Siege of Boston take place? Henry Knox bringing his "noble train" of artillery to Cambridge. Question 3: Its leading citizens would have important roles in the development of the future ________. Question 4: Worse, ________ and smallpox had broken out in the city. What was Siege of Boston a part of? Which of the following was a combatant in the Siege of Boston? 1775 map of the Battle of Lexington and Concord and the Siege of Boston. George Washington taking command of the Army. 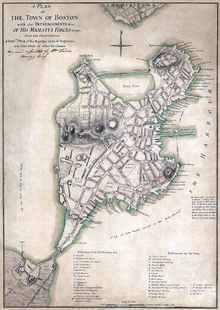 The British defenses in Boston, 1775. How many casualties were there in the Siege of Boston? Who was a commander in the Siege of Boston? Question 10: Prior to 1775, the British had imposed taxes and import duties on the American colonies, to which the colonists objected, since they lacked representation in the ________.